Beautifully detailed chart showing the triangulation of the coast of Georgia and South Carolina. Sketch E Showing the Progress of the Survey in Section No. V from 1847 to 1859. This is an appealing 1859 U.S. Coast Survey triangulation chart or map of the Georgia and South Carolina coastline from Cumberland Island to Bald Head Island in North Carolina. 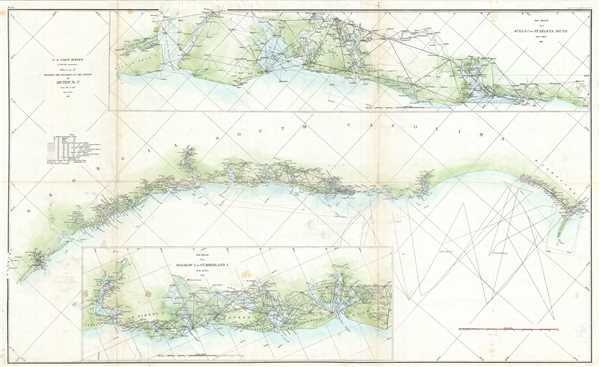 Essentially three maps on a single sheet, the top map features a triangulation of the coast from Hilton Head (Port Royal Sound) to Charleston. The bottom map extends from Ossabaw Island to Cumberland Island. Focuses on the inlets and waterways, indicates, lighthouses and important channels and shows the progress of the survey work in this area by date-annotated sections. Nautically this map offers a wealth of practical information for the Mariner, including countless depth soundings and notes on light hoses, tides, shoals, and other undersea dangers. This map was compiled under the direction of A. D. Bache, Superintendent of the Survey of the Coast of the United States and one of the most influential American cartographers of the 19th century, and issued in the 1859 edition of the Superintendent's Report. Very good. Minor wear and some along original fold lines. Minor spotting. Professionally flattened and backed with archival tissue.